Now Available. Order Service Online! At Cooper, we receive many different types of service calls from within Montgomery County Pennsylvania. Since we have offices and technicians situated in various locations throughout Pennsylvania, we can resolve any pest problem within Montgomery County quickly. We provide FREE No-Obligation Estimates for all of our services and our mouse, small nuisance ant, carpenter ant, carpenter bee and stinging insect services are available for convenient online purchase. 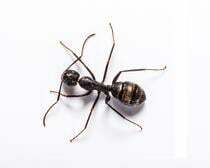 Ants – You may experience many types of ant problems such as Carpenter Ants, Flying Ants, Pavement Ants, Odorous House Ants, Cornfield Ants, False Honey Ants, and Little Black Ants. Although these pests are more of an annoyance since they are not damaging the structure of your home like Carpenter Ants, at Cooper, we realize that you do not want these pests in your home which is why we offer services to prevent and eliminate ant problems. Schedule service for small ants online today for fast technician dispatch. If you have carpenter ants, you can also schedule service online today for fast, convenient service or contact us for a free no obligation pest evaluation. Termites –Eastern Subterranean Termites are a common wood destroying insect found in the northeastern part of the United States. Termites fulfill an important role in our ecological system by speeding up the natural process of deterioration and help turn the dead wood into new soil. Unfortunately, termites don't know the difference between a stump in your yard and the wood in your home. At Cooper, we specialize in termite prevention and active termite management. Bed Bugs – Bed Bugs, unlike other insects that feed on blood, have never been proven to transmit disease to humans. However, bed bugs bites can cause itchy red welts in some people and are often confused with poison ivy or an allergic reaction of some kind. Many people also find the presence of bed bugs distressing and may have trouble sleeping. At Cooper, we specialize in bed bug elimination and we are the recognized national leader on the subject of bed bugs and for the treatment of bed bugs. If you suspect that you have bed bugs, please contact Cooper immediately. Carpenter Bees- Eliminating Carpenter Bees and those ugly stains on your home can be a simple and easy process. Cooper offers a service that not only removes active Carpenter Bee infestations, but our service also prevents Carpenter Bees from returning and drilling new holes. Cooper Pest Solutions can break the Carpenter Bee cycle with our preventative service! Are you currently seeing carpenter bees around your home? Schedule service for carpenter bee removal online today for fast technician dispatch. Mouse Control and Elimination – Mice normally find their way indoors searching for food and in order to keep warm through the winter. Since mice have collapsible bodies, they can get into homes through cracks or holes smaller than a dime. Mice are included with our home services and you can also conveniently purchase our One-Time Mouse Removal Service online. Rodent & Wildlife Exclusion- If you experience recurring problems with mice, squirrels, or other rodents getting into your house, a permanent (and highly recommended) solution is available from Cooper Pest Solutions. Since rodents can squeeze into the tiniest of places, older home structures often have many gaps that rodents find very attractive, and this is how they enter your home. Our service includes: utilizing door sweeps placed on garage doors where open gaps are visible, sealing exterior cracks in foundation walls to prevent rodent entry, closing all open voids around drain pipes and conduits both inside and outside of the home, and recurring roof and attic vulnerabilities against rodent and pest entry. To learn more about our Rodent and Wildlife Exclusion Service, click here. Stinging Insect Nest Removal and Wasp Prevention – To remove an active yellow jacket, wasp, or hornet nest, click here to conveniently order service online. We also offer a Wasp prevention program that prevents paper wasps from building their nests on homes, decks, swing sets, storage sheds, etc. By preventing nest building, the presence of Wasps will be greatly reduced. One treatment will prevent nest development for up to six months. To learn more about our Wasp Prevention Service click here. Mosquitoes – At Cooper we offer homeowners a guaranteed mosquito bite-free yard. This means that Cooper Pest Solutions will give homeowners back their yards for a fixed seasonal price all summer by controlling and repelling mosquitoes on your property. At Cooper, we realize that mosquitoes are a real annoyance and residents really want to enjoy their backyards without fear of being eaten alive. To learn more about our Mosquito Free service, click here. Ticks- Ticks are known to transmit diseases, including Lyme Disease, Rocky Mountain spotted fever, and Tularemia. Cooper can prevent ticks from entering your yard with minimal use of pesticides.To learn more about our tick service, click here. If you have a recurring pest problem or more than one pest causing problems at your Montgomery County home, you may want to consider one of our home protection plans. Our Traditional and Intensive Service plans protect your home while keeping your family safe from intruding pests year round. If you have a pest problem in Montgomery County, please give us a call at today. Cooper Pest Solutions has an average rating of 4.9 out of 5 stars from 226 reviews. 4.8 Read Google Reviews.